Homes For Sale In Crystal River Real Estate and Land For Sale in Crystal River Florida. - CENTURY 21 J.W. Morton Real Estate, Inc. 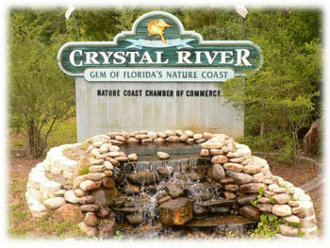 Crystal River Florida is located on the west side of Citrus County right on the Gulf of Mexico. Crystal River used to be a sleepy little fishing town. In recent years the city of Crystal River has bloomed into a fun and exciting place to live. Something is always going on in Crystal River. Much of the Crystal River activities revolve around the water. Boating and fishing in the Kings Bay and the Gulf of Mexico are are always a favorite past time for residents and visitors alike. One of the most famous activities in Crystal River is to swim with the manatees. The natural spring fed waters of Crystal River offer a warm refuge for the West Indian manatees during the winter months. A large area of Crystal River is designated as a manatee and wildlife sanctuary. There are protected wetland for bird watching and even an ancient archaeological mound site where early humans occupied the area thousands of years ago. Crystal River offers exciting nightlife at the many waterfront restaurants and bar & grills with live bands and street festivals live the Stone Crab Jam, Manatee Festival, St. Patrick's Day Parade starting at Burks of Ireland Pub and many more. The Heritage Village in Downtown Crystal River is a unique collection of quaint shops where you can expect to find things you cannot find anywhere else. From antiques to kayaks, to home accessories, to nautical to wine and tea bars and fine dining at the Cafe of the Avenue, you will enjoy this shopping adventure. There are several residential communities offering a home in Crystal River that range from mobile home parks, to single family homes to maintenance free villas, condos and town homes to exclusive waterfront mansions on Kings Bay Drive and everything in between. If you are interested in looking for your next home in Crystal River Florida and what to see the homes for sale in Crystal River, please contact us today!